England must bat through the entire final day with just five wickets left if they are to rescue the most improbable draw from this third Test and keep the Ashes alive. On a day that began with an all-out Australian assault on their dispirited bowlers and bottomed out with a golden duck for captain Alastair Cook, England closed on 251-5, still a mammoth 253 short of their nominal target of 504. The impressive Ben Stokes will resume on 72 and Matt Prior seven, but their task on a badly cracked pitch would appear futile after the failure once again of too many senior players. 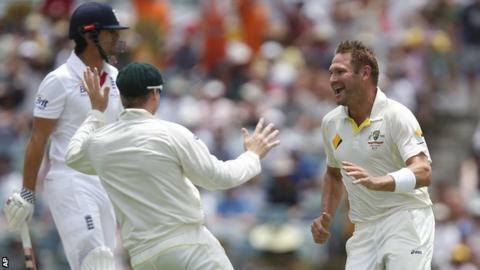 While Cook received a peach of a delivery from Ryan Harris to be bowled first ball and Ian Bell played well for his 60, Kevin Pietersen was caught on the boundary trying to hit Nathan Lyon into the stands. "There will be optimistic England fans thinking they can get these runs, but it has never been done before and the tail will have to face the second new ball. It will be late in the morning or just after lunch that Australia regain the Ashes." Cook's wicket continued his miserable series, the weight of this failing team appearing heavy on his shoulders, while Pietersen is averaging 27 from his six underwhelming innings. Once again Australia were superior in every department, and if they seal the series to win back the Ashes for the first time in seven years as now seems inevitable, it will be entirely merited. Stuart Broad will bat only if required to save the game after sustaining heavy bruising to his right foot when being pinned lbw by Mitchell Johnson in the first innings, meaning after the not-out batsmen, only Tim Bresnan, Graeme Swann and James Anderson realistically remain in Australia's way. Michael Clarke's confident, aggressive side hit new heights on Monday morning as they dismantled England's much-decorated attack in a brutal hour of sustained hitting. Shane Watson made a century off only 106 balls, with 11 fours and five sixes, as he smashed Swann out of the attack. In the first 13 balls he faced from the off-spinner he cracked 37 runs as he moved from his overnight 29 to his fourth Test century in a blistering 40 balls. England dropped one catch and let another fall between two hesitant fielders as they fell apart even more completely than they had during Sunday's hapless display. When Bresnan did take a fine catch on the boundary he tumbled over the ropes, although he could not be blamed for either that or the farcical way in which Watson eventually fell for 106. The number three top-edged an ugly pull only for Bell to spill the regulation catch, and when Bresnan picked up the loose ball to hurl down the stumps with Watson open-mouthed and leaden-footed mid-pitch, it was almost as much in anger as aim. Steve Smith was caught at mid-wicket by substitute fielder Jonny Bairstow off Stokes for 15, but it only heralded the next cavalry charge as George Bailey launched into Anderson to the roaring delight of the Waca crowd. In one over he hit an extraordinary 28 runs, including three straight sixes and two fours, to equal the world record for the most runs scored off a Test over and humiliate England still further. In all 134 runs were added in 17 overs as Australia declared on 369-6. It was the first time in Test history that a team has been set a fourth innings target of 500-plus in three consecutive matches, and England began in the worst possible fashion. Harris produced a ball that swung in and then moved away to clip the off bail as Cook's 100th Test brought his first ever first-ball dismissal. Michael Carberry and Joe Root survived the first hour after lunch before the opener was trapped lbw for 31 by a full inswinging ball from Shane Watson, while Root failed with a review after being brilliantly caught behind by Brad Haddin for 19 off Mitchell Johnson. Pietersen and Bell then took the score to 121 before Pietersen, as so many times in this series, walked straight into the trap set by Clarke and his bowler. It was left to Stokes in only his second Test to provide the sole silver lining after Bell perished for a well-made 60 attempting to upper-cut Peter Siddle over Haddin. His 50 came up off 69 balls with nine fours as he showed exactly the application and discipline that has too often been missing from his far more experienced team-mates. But to expect him to salvage something from the wreckage of this England performance is both unrealistic and unfair, and at some stage on Tuesday, Australia will almost certainly once again be in possession of the famous old urn. Listen to Jonathan Agnew and Geoffrey Boycott's review of the day on the TMS podcast page. For a gallery of images from day four, go to the BBC Sport Facebook page.